Exercise is physical activity that is planned, structured, and repetitive for the purpose of conditioning any part of the body. Exercise is used to improve health, maintain fitness and is important as a means of physical rehabilitation. Exercise is useful in preventing or treating coronary heart disease, osteoporosis, weakness, diabetes, obesity, and depression. Range of motion is one aspect of exercise important for increasing or maintaining joint function. Strengthening exercises provide appropriate resistance to the muscles to increase endurance and strength. Cardiac rehabilitation exercises are developed and individualized to improve the cardiovascular system for prevention and rehabilitation of cardiac disorders and diseases. A well-balanced exercise program can improve general health, build endurance, and slow many of the effects of aging. The benefits of exercise not only improve physical health, but also enhance emotional well-being. Studies have shown that a consistent, guided exercise program benefits almost everyone from Gulf War veterans coping with fatigue, distress, cognitive problems, and mental health functioning to patients awaiting heart transplants. Exercise in combination with a reduced-calorie diet is the safest and most effective method of weight loss. The United States Department of Agriculture (USDA) food pyramid, called MyPyramid, makes exercise as well as food recommendations to emphasize the interconnectedness between exercise, diet, and health. Before beginning any exercise program, an evaluation by a physician is recommended to rule out potential health risks. Once health and fitness level are determined and any physical restrictions identified, the individual's exercise program should begin under the supervision of a health care or other trained professional. This is particularly true when exercise is used as a form of rehabilitation. If symptoms of dizziness, nausea, excessive shortness of breath, or chest pain are present during exercise, the individual should stop the activity and inform a physician about these symptoms before resuming activity. Exercise equipment must be checked to determine if it can bear the weight of people of all sizes and shapes. Individuals must be instructed in the proper use of exercise equipment in order to prevent injury. Range of motion exercise refers to activity aimed at improving movement of a specific joint. This motion is influenced by several structures: configuration of bone surfaces within the joint, joint capsule, ligaments, tendons, and muscles acting on the joint. There are three types of range of motion exercises: passive, active, and active assists. Passive range of motion is movement applied to a joint solely by another person or persons or a passive motion machine. When passive range of motion is applied, the joint of an individual receiving exercise is completely relaxed while the outside force moves the body part, such as a leg or arm, throughout the available range. Injury, surgery, or immobilization of a joint may affect the normal joint range of motion. Active range of motion is movement of a joint provided entirely by the individual performing the exercise. In this case, there is no outside force aiding in the movement. Active assist range of motion is described as a joint receiving partial assistance from an outside force. This range of motion may result from the majority of motion applied by an exerciser or by the person or persons assisting the individual. It also may be a half-and-half effort on the joint from each source. Strengthening exercise increases muscle strength and mass, bone strength, and the body's metabolism. It can help attain and maintain proper weight and improve body image and self-esteem. A certain level of muscle strength is needed to perform daily activities such as walking, running, and climbing stairs. Strengthening exercises increase muscle strength by putting more strain on a muscle than it is normally accustomed to receiving. This increased load stimulates the growth of proteins inside each muscle cell that allow the muscle as a whole to contract. There is evidence indicating that strength training may be better than aerobic exercise alone for improving self-esteem and body image. Weight training allows one immediate feedback, through observation of progress in muscle growth and improved muscle tone. Strengthening exercise can take the form of isometric, isotonic and isokinetic strengthening. During isometric exercises, muscles contract. However, there is no motion in the affected joints. The muscle fibers maintain a constant length throughout the entire contraction. The exercises usually are performed against an immovable surface or object such as pressing one's hand against a wall. The muscles of the arm are contracting but the wall is not reacting or moving in response to the physical effort. Isometric training is effective for developing total strength of a particular muscle or group of muscles. It often is used for rehabilitation since the exact area of muscle weakness can be isolated and strengthening can be administered at the proper joint angle. This kind of training can provide a relatively quick and convenient method for overloading and strengthening muscles without any special equipment and with little chance of injury. Isotonic exercise differs from isometric exercise in that there is movement of a joint during the muscle contraction. A classic example of an isotonic exercise is weight training with dumbbells and barbells. As the weight is lifted throughout the range of motion, the muscle shortens and lengthens. Calisthenics are also an example of isotonic exercise. These would include chin-ups, push-ups, and sit-ups, all of which use body weight as the resistance force. Isokinetic exercise utilizes machines that control the speed of contraction within the range of motion. Isokinetic exercise attempts to combine the best features of both isometrics and weight training. It provides muscular overload at a constant preset speed while a muscle mobilizes its force through the full range of motion. For example, an isokinetic stationary bicycle set at 90 revolutions per minute means that no matter how hard and fast the exerciser works, the isokinetic properties of the bicycle will allow the exerciser to pedal only as fast as 90 revolutions per minute. Machines known as Cybex and Biodex provide isokinetic results; they generally are used by physical therapists. Exercise can be very helpful in prevention and rehabilitation of cardiac disorders and disease. With an exercise program designed at a level considered safe for the individual, people with symptoms of heart failure can substantially improve their fitness levels. The greatest benefit occurs as muscles improve the efficiency of their oxygen use, which reduces the need for the heart to pump as much blood. While such exercise does not necessarily improve the condition of the heart itself, the increased fitness level reduces the total workload of the heart. The related increase in endurance also should translate into a generally more active lifestyle. Endurance or aerobic routines, such as running, brisk walking, cycling, or swimming, increase the strength and efficiency of the muscles of the heart. A physical examination by a physician is important to determine if strenuous exercise is appropriate or detrimental for an individual, especially when the exercise program is designed for rehabilitation. Before exercising, proper stretching is important to prevent the possibility of soft tissue injury resulting from tight muscles, tendons, ligaments, and other joint-related structures. Proper cool down after exercise is important in reducing the occurrence of painful muscle spasms. Proper cool down stretching also may decrease frequency and intensity of muscle stiffness the day following any exercise program. Improper warm up can lead to muscle strains. Overexertion without enough time between exercise sessions to recuperate also can lead to muscle strains, resulting in inactivity due to pain. Stress fractures also are a possibility if activities are strenuous over long periods without proper rest. Although exercise is safe for the majority of children and adults, there is still a need for further studies to identify potential risks. Significant health benefits are obtained by including a moderate amount of physical exercise in the form of an exercise prescription. This is much like a drug prescription in that it also helps enhance the health of those who take it in the proper dosage. Physical activity plays a positive role in preventing disease and improving overall health status. People of all ages, both male and female, benefit from regular physical activity. Regular exercise also provides significant psychological benefits and improves quality of life. Exercise burnout may occur if an exercise program is not varied and adequate rest periods are not taken between exercise sessions. Muscle, joint, and cardiac disorders have been noted among people who exercise. However, they often have had preexisting or underlying illnesses. Exercise training that is geared to provide a sufficient cardiovascular overload to stimulate increases in cardiac output. Exercise involving free movement without the aid of equipment. The time limit of a person's ability to maintain either a specific force or power involving muscular contractions. A disorder characterized by loss of calcium in the bone, leading to thinning of the bones. It occurs frequently in postmenopausal women. "Exercise and Physical Fitness." MedlinePlus. February 25, 2009 [cited February 26, 2009]. http://www.nlm.nih.gov/medlineplus/exerciseandphysicalfitness.html. "Exercise for Children." MedlinePlus. February 23, 2009 [cited February 26, 2009]. http://www.nlm.nih.gov/medlineplus/exerciseforchildren.html. "Exercise for Seniors." MedlinePlus. February 18, 2009 [cited February 26, 2009]. http://www.nlm.nih.gov/medlineplus/exerciseforseniors.html. American College of Sports Medicine. P. O. Box 1440, Indianapolis, IN 46206-1440. Telephone: (317) 637-9200. Fax: (317) 634-7817. http://www.acsm.org. American Medical Association. 515 N. State Street, Chicago, IL 60610. (800) 621-8335. http://www.ama-assn.org. American Physical Therapy Association. 1111 North Fairfax Street, Alexandria, VA 22314-1488. (800) 999-APTA (2782) or (703) 684-APTA (2782). TDD: (703) 683-6748. http://www.apta.org. National Athletic Trainers' Association. 2952 Stemmons Freeway, Dallas, TX 75247-6916. (800) 879-6282 or (214) 637-6282. Fax: (214) 637-2206. http://www.nata.org. performance of physical exertion for improvement of health or correction of physical deformity. active exercise motion imparted to a part by voluntary contraction and relaxation of its controlling muscles. active assistive exercise voluntary contraction of muscles controlling a part, assisted by a therapist or by some other means. aerobic exercise a type of physical activity that increases the heart rate and promotes increased use of oxygen in order to improve the overall body condition. ballistic stretching e's rapid, jerky movements employed in exercises to stretch muscles and connective tissue. Buerger-Allen e's see buerger-allen exercises. cardiovascular exercise exercises to promote improved capacity of the cardiovascular system. They must be administered at least twice weekly, with most programs conducted three to five or more times weekly. The contraction of major muscle groups must be repeated often enough to elevate the heart rate to a target level determined during testing. Used in the treatment of compromised cardiovascular systems, as in cardiac rehabilitation, or as a preventive measure. endurance exercise any exercise that involves the use of several large groups of muscles and is thus dependent on the delivery of oxygen to the muscles by the cardiovascular system; used in both physical fitness programs and testing of cardiovascular and pulmonary function. isokinetic exercise dynamic muscle activity performed at a constant angular velocity. isometric exercise active exercise performed against stable resistance, without change in the length of the muscle. isotonic exercise active exercise without appreciable change in the force of muscular contraction, with shortening of the muscle. Kegel e's see kegel exercises. McKenzie exercise an exercise regimen used in the treatment of low back pain and sciatica, prescribed according to findings during mechanical examination of the lumbar spine and using a combination of lumbar motions, including flexion, rotation, side gliding, and extension. It is sometimes referred to as McKenzie extension exercises, but this is a misnomer because the regimen involves movements other than extension. muscle-setting exercise voluntary contraction and relaxation of skeletal muscles without changing the muscle length or moving the associated part of the body. Called also static exercise. passive exercise motion imparted to a segment of the body by another individual, machine, or other outside force, or produced by voluntary effort of another segment of the patient's own body. 1. a combination of endurance and strength exercises of the pelvic floor (circumvaginal or perianal) muscles, used in the management of stress urinary incontinence; the patient is taught to isolate and contract muscles once or twice a day. 2. in the nursing interventions classification, a nursing intervention defined as pelvic muscle exercise strengthening and training of the levator ani and urogenital muscles through voluntary, repetitive contraction to decrease stress, urge, or mixed types of urinary incontinence. quadriceps setting exercise an isometric exercise to strengthen muscles needed for ambulation. The patient is instructed to contract the quadriceps muscle while at the same time elevating the heel and pushing the knee toward the mat. range of motion (ROM) e's exercises that move each joint through its full range of motion, that is, to the highest degree of motion of which each joint normally is capable; they may be either active or passive. 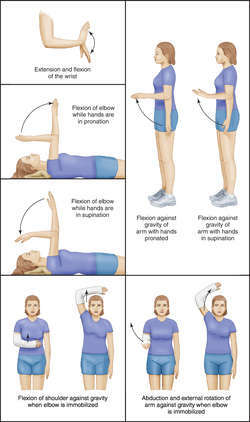 Examples of range of motion exercises. A, Flexion: The bending of a joint. B, Extension: A movement opposite to flexion in which a joint is in a straight position. C, Rotation: Pivoting a body part around its axis, as in shaking the head. D, Abduction: A movement of a limb away from the median plane of the body; the fingers are abducted by spreading them apart. E, Adduction: Moving toward the midline of the body or to the central axis of a limb. F, Circumduction: A combination of movements that cause a body part to move in a circular fashion. G, Supination: Extension of the forearm to bring the palm of the hand upward. H, Pronation: Movement of the forearm in the extended position that brings the palm of the hand to a downward position. I, Inversion: Movement of the ankle to turn the sole of the foot medially. J, Eversion: Movement of the sole of the foot laterally. From Lammon et al., 1995.
resistance e's (resistive e's) activities designed to increase muscle strength, performed against an opposing force; the resistance may be either isometric, isotonic, or isokinetic. static stretching e's the placement of muscles and connective tissues at their greatest length by steady force in the direction of lengthening. Short duration forces can be obtained manually, but special traction devices, splints, and casts are generally used to apply low-intensity forces for prolonged periods (30 minutes or longer). Warming the soft tissue before or during stretching will generally facilitate lengthening. exercise stress tests tests used in exercise testing. Clinical exercise testing has become an important tool in screening for and diagnosing early ischemic heart disease that cannot be detected by a standard resting EKG, and in predicting the probability of the development of the condition in later years. The technique cannot determine the location of the lesion causing cardiac ischemia and therefore must be supplemented with angiocardiography when coronary occlusion is detected. Common forms of exercise used include the treadmill and the bicycle ergometer. These procedures must be performed in a clinical setting where health care personnel are available in the event symptoms develop during exercise, such as dyspnea, vertigo, extreme fatigue, severe arrhythmias, or other abnormal EKG readings. Exercise testing also may be used to assess the pulmonary status of a patient with a respiratory disease. As the patient performs specific exercises, blood samples are drawn for blood gas analysis, and ventilatory function tests such as tidal volume, total lung capacity, and vital capacity are conducted. Among the types of therapeutic exercise are those that (1) increase or maintain mobility of the joints and surrounding soft tissues, (2) develop coordination through control of individual muscles, (3) increase muscular strength and endurance, and (4) promote relaxation and relief of tension. Prevention of the loss of joint motion is much less costly and time-consuming than correction of tissue changes that seriously impair joint mobility. It is recommended that each joint should be put through its full range of motion three times at least twice daily. If the patient is not able to carry out these exercises, he is assisted by a therapist or member of the family who has been instructed in the exercises. Inflammation of the joint, as in arthritis, may cause some pain on motion, and so passive exercises are done slowly and gently with the joint as relaxed as possible. Procedures that stretch tight muscles to increase joint motion should be done only by a skilled therapist who understands the hazards of fracture and bleeding within the joint, which can occur if the exercises are done improperly or too strenuously. The development of conscious control over individual muscles is useful in the rehabilitation of patients with a variety of disorders, including physical trauma, diseases such as poliomyelitis that affect the motor neurons, and congenital disorders such as cerebral palsy. It involves a systematic program of sequential activities under the direction of a therapist knowledgeable in the technique. Although it requires much effort on the part of the patient and the therapist, the attainment of muscle control and coordination is a satisfying reward. Strengthening (force increasing) exercises are prescribed after an examination has shown weakness in individual muscles or muscle groups. These exercises are usually administered with relatively high resistance and few (3 to 10) repetitions. A group of exercises, called a set, is followed by a few minutes of rest. Three to 5 sets for a muscle or group constitute one bout of exercises. Strengthening exercises are often performed daily in early stages of rehabilitation, but less often later in treatment. Endurance exercises stimulate changes in the involved muscle or muscles, resulting in improved capacity for repeated contraction (e.g., increased ability to use metabolites). When conducted over a sufficient length of time and with several muscle groups, they may also produce central effects of the cardiovascular system (see cardiovascular exercise). Endurance exercises employ relatively low resistance and numerous (15 or more) repetitions. Endurance exercises are generally administered daily. Relief of Tension. Exercises that promote relaxation of the muscles and provide relief from the effects of tension are useful in a wide variety of disorders ranging from mild tension headache to insomnia. Patients who are especially tense may require several sessions of instruction in relaxation before they can learn the technique. Williams' e's (Williams' flexion e's) a therapeutic exercise regimen used in the treatment of low back pain; it seeks to reduce lumbar lordosis through flexion of the lumbar spine and strengthening of the abdominal musculature. (ek'sĕr-sīz), Avoid the misspellings excercise, exersise, exercize, and other variants. 1. Active exercise: bodily exertion for the sake of restoring or maintaining a healthy state. 2. Passive exercise: motion of limbs without effort by the person. /ex·er·cise/ (ek´ser-sīz) performance of physical exertion for improvement of health or correction of physical deformity. aerobic exercise that designed to increase oxygen consumption and improve functioning of the cardiovascular and respiratory systems. endurance exercise one that involves the use of several large groups of muscles and is thus dependent on the delivery of oxygen to the muscles by the cardiovascular system. isokinetic exercise dynamic muscle activity performed at a constant angular velocity; torque and tension remain constant while muscles shorten or lengthen. Kegel exercises exercises performed to strengthen the pubococcygeal muscle. passive exercise motion imparted to a part by another person or outside force, or produced by voluntary effort of another segment of the patient's own body. range of motion exercise the putting of a joint through its full range of normal movements, either actively or passively. resistance exercise , resistive exercise that performed by the patient against resistance, as from a weight. b. To put through exercises: exercise a platoon. 1 n, the performance of any physical activity for the purpose of conditioning the body, improving health, or maintaining fitness or as a means of therapy for correcting a deformity or restoring the organs and body functions to a state of health. 2 n, any action, skill, or maneuver that causes muscle exertion and is performed repeatedly to develop or strengthen the body or any of its parts. 3 v, to use a muscle or part of the body in a repetitive way to maintain or develop its strength. Exercise has a beneficial effect on each of the body systems, although in excess it can lead to the breakdown of tissue and cause injury. Kinds of exercise are active assisted exercise, active exercise, active resistance exercise, aerobic exercise, anaerobic exercise, isometric exercise, isotonic exercise, muscle-setting exercise, passive exercise, progressive resistance exercise, range of motion exercise, therapeutic exercise, and underwater exercise. Public health The rhythmic contraction of muscles against a force Pros ↓ risk of cholecystectomy, ↓ risk of CAD, CHD, CA–colorectal, breast, prostate, DM–improved insulin utilization, obesity, stroke, osteoporosis, stress, anxiety; ↑ sexual pleasure, strength, flexibility, stamina, psychological well-being, general health; improved reaction time, memory, moods, immune resistance, sleep, self-confidence, control of arthritis, weight, quality of life. See Aerobic exercise, Anaerobic exercise, Breathing exercise, Cardiovascular exercise, Codman's pendulum exercise, Hoshino exercise, Isometric exercise, Isotonic exercise, Pritikin exercise, Vigorous exercise. 1. Active: Planned repetitive physical activity structured to improve and maintain physical fitness. 2. Passive: motion of limbs without effort by the patient. Daily physical activity for a minimum of 35 min will increase exercise capacity and the ability to use oxygen to derive energy for work, decrease myocardial oxygen demands for the same level of work, favorably alter lipid and carbohydrate metabolism, prevent cardiovascular disease, and help to control body weight and body composition. An exercise program should include developing joint flexibility and muscle strength, esp. in the trunk and limbs. This is of particular importance as people age. Exercise can have a beneficial effect in patients with depression or anxiety. It is thought to have a positive effect on balance, endurance, attitude, and outlook. Most of the negative aspects of aging can be either altered or diminished by a lifelong healthy lifestyle. For example, the loss of physical fitness and strength, an inevitable consequence of aging, can be altered by an individualized fitness and strength program. Progressive loss of bone mass due to osteoporosis may be either prevented or slowed by a program of regular exercise. Loss of cardiac fitness can be forestalled by an ongoing aerobic fitness program. Many cases of type 2 diabetes can be controlled by exercise and an appropriate diet. Arthritic stiffness and loss of flexibility can be influenced favorably by exercise, e.g., by walking and jogging; for patients who experience joint pain with impact exercise, swimming is an alternative. Obesity and loss of muscle mass can be prevented or minimized. Exercise stimulates release of endorphins, and people who participate in regular exercise programs express positive feelings toward living. Exercise programs can be adapted for patients who are confined to wheelchairs. An important consideration for any exercise program is that it be enjoyable. No matter how beneficial the program may be, if it is not enjoyable or rewarding, it will not be continued. A type of bodily movement performed by voluntary contraction and relaxation of muscles. Exercise during which oxygen is metabolized to produce energy. Aerobic exercise is required for sustained periods of physical exertion and vigorous athletic activity. High-intensity exercise, such as sprinting or weight lifting, that places more demand on muscles than oxygen delivery can match. When this occurs, glucose is metabolized for its stored energy without using oxygen as a reactant. Adenosine triphosphate (ATP) is produced rapidly, as well as the byproduct, lactic acid. The use of a pool or an immersion tank filled with water for exercise. Such exercises may be used to improve balance and gait, enhance physical endurance, mobilize joints, and/or strengthen or stretch muscles. A type of bodily movement performed by voluntary muscle contractions that are augmented by an extrinsic force such as a clinician or mechanical device. A form of isotonic exercise in which the muscle fibers shorten as tension develops. Use of specific exercises to correct deficiencies caused by trauma, inactivity, muscular imbalances, poor flexibility, or biomechanical inadequacies. An exercise in which there is overall lengthening of the muscle in response to an external resistance. An activity, e.g., stretching, designed to increase joint range of motion and extensibility of muscle. An exercise carried through with no external assistance. An exercise with equipment that uses variable resistance to maintain a constant velocity of joint motion during muscle contraction, so that the force generated by the muscle is maximal through the full range of motion. An active muscle contraction in which the force exerted remains constant and muscle length changes. An exercise that requires the foot (or hand) to apply pressure against a plate, pedal, or ground. This rehabilitation concept was determined by the anatomical functional relationship in the lower extremities. It also applies to the upper extremities. Kinetic chain describes how forces occur during human motion and how segments of the body are linked together. Kinetic chain exercises can either be open or closed. Open kinetic chain exercises are unrestricted movements in space of a peripheral segment of the body. Closed kinetic chain exercises are movements in which the distal segment meets with external resistance and remains fixed. Closed kinetic chain exercises are more functionally based than open chain exercises. Kinetic chain exercises can either be open or closed. Kinetic chain describes how forces occur during human motion and how segments of the body are linked together. Open kinetic chain applies to unrestricted movement in space of a peripheral segment of the body. In closed kinetic chain exercises, the distal segment meets with external resistance, and remains fixed. Brainteasers, association tasks, calculations, puzzles, and other mental and physical exercises designed to stimulate thinking, problem solving, and other cerebral functions. A form of active resistive exercise based on a principle of gradual increase in the amount of resistance in order to achieve maximum strength. Movement of a joint through its available range of motion. It can be used to prevent loss of motion. A form of active resistive exercise that advocates gradual reduction in the amount of resistance as muscles fatigue. An exercise (such as yoga, tai chi, dance, prayer, or meditation) that induces a relaxation response. Exercise in which a muscle contraction is opposed by force to increase strength or endurance. If the resistance is applied by using weights, it is mechanical resistance; if applied by a clinician, it is manual resistance. The application of fluctuating resistance loads while the patient stabilizes the part being trained in a symptom-free position. Exercises begin easily so that control is maintained, and progress in duration, intensity, speed, and variety. A therapeutic exercise maneuver, using physiological principles, designed to increase joint range of motion or extensibility of pathologically shortened connective tissue structures. The use of physical activity or training as a means of improving flexibility, health, strength, or well being; fostering recovery from injury or surgery; preventing complications of injury or illness; or improving or maintaining functional performance. Therapeutic exercise interventions may include techniques to improve motion, strength, motor control, muscle and cardiopulmonary endurance, and efficiency, posture, balance, and coordination. * These estimates are approximate and can serve only as a general guide. They are based on an average person who weighs 160 lb (72.58 kg). † Energy requirements for swimming are not provided because of variables such as water temperature, whether the water is fresh or salt, buoyancy of the individual, and whether the water is calm or not. Muscular activity undertaken for the promotion of health and for the pleasure inherent in the use of the body. Modern sedentary life involves a dangerous degree of under-exertion and much of the bodily disorder suffered today can be attributed to the use of artificial energy sources to replace the use of one's own musculature. n the performance of physical activity for the purpose of conditioning the body, improving health, or maintaining fitness or as a means of therapy for correcting a deformity or restoring the organs and bodily function to a state of health. performance of physical exertion to obtain food or to achieve normal functions such as reproduction, for pleasure and for improvement of health or correction of physical deformity. motion imparted to a part by voluntary contraction and relaxation of its controlling muscles. repeated exercise to condition an animal for a better performance at another time depends on an improvement in cardiovascular responses, splenic contraction and muscle, ligament and tendon responses. manifested by a disinclination to move quickly in the absence of any apparent physical lameness or incoordination and respiratory distress on exercise. motion imparted to a segment of the body by a therapist, machine or other outside force. includes the integrated physiological responses to exercise plus physical conditioning by training. a technique for evaluating circulatory response to physical stress; called also stress testing. The procedure involves continuous electrocardiographic monitoring during physical exercise, the objective being to increase the intensity of physical exertion until a target heart rate is reached or signs of cardiac ischemia appear. the scientific use of bodily movement to restore normal function in diseased or injured tissues or to maintain a state of well-being. Called also corrective exercise. one of the ways to measure cardiac and circulatory system efficiency is to measure the response of the cardiac and respiratory systems to graded exercise. In most animals such tests must be subjective because no data are available on normal responses. In horses tests are available for assessment of cardiopulmonary disease and as a measure of fitness. Q. Do you exercise at all? If so, what exercise do you perform and why? What are it's benefits? I am looking to incorporate different routines and exercises into my workouts and would like your assistance. A. i do 60 pushups,60 situps, and run 2 miles in 15 mins. then lift weights,my whole work out lasts about an hour a day. Q. How much exercise should I do. I am very fond of exercise. But I get tired soon and loosing my energy. How much exercise should I do? Q. How do you motivate yourself to exercise? I have a problem- I can easily get myself to go to work and other strenuous things, but when I need to get myself out for some exercise, which is only for me, I don’t find the energy for that. Does anyone have any tips how to encourage myself? A. Try to change to an exercise you enjoy. You can also exercise with a friend, and the commitment to him may give you another push. Another option is to join a regular exercise program in a gym. Good luck! To our knowledge, our study is the first to study exercise testing using a rectilinear reciprocating motion. Since peak exercise testing is difficult in this clinical population, we hoped to gain additional insight into exercise testing response over each minute for the first 6 minutes of the test. 1]) during cardiopulmonary exercise testing may also be expressed as a function of VE (units: ml * [min. Test- retest reliability for two indices of ventilatory efficiency measured during Cardiopulmonary exercise testing in healthy men and women? In different centres in Europe studies for exercise testing in CAD using MFI are initiated. Sports medicine specialists increasingly recognize the limitations of exercise testing. Their conclusion: "A low value for heart-rate recovery after exercise testing, which has been previously shown to be a marker of decreased vagal activity, is a powerful and independent predictor of the risk of death. Study design: Spirometry and exercise testing were performed twice a day on the 24 patients before and after inhalation of OTB 300 [mu]g or placebo 300 [mu]g (Figure 1). Pryor, "Generally, there's little to gain from the indiscriminant use of exercise testing in low-risk people. SunTech Medical and GE Healthcare have entered into a worldwide agreement whereby GE Healthcare will offer the SunTech Tango+ blood pressure monitor with its CASE Cardiac Assessment System for Exercise testing and CardioSoft Exercise Stress Testing.